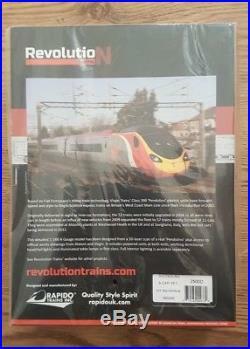 This is a model of a nine coach Virgin Trains Pendolino electric multiple unit, made by Rapido Trains Inc. For RevolutioN Trains, in all it's packaging, still sealed, fitted with DCC Sound. This particular model is of 390045, named 101 Squadron. And has working head and tail lights on the driving vehicles, along with working table lamps in the first class centre coaches. The driving vehicles have a removable front panel to allow you to couple a locomotive to the front, as the real train would for non-electrified railways, such as the North Wales coast line, and the occasional rescue by a locomotive. 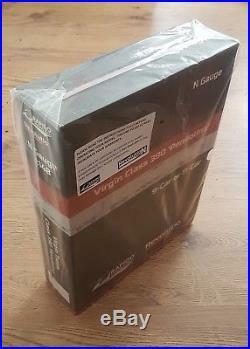 The packaging is a card sleeve, containing two sturdy'book sets', enclosed in a loose plastic wrapping. The first book set has two motorised driving vehicles and three centre cars, a series of construction and part diagrams, and a manual containing information on the model and a brief history of the prototype. The second book set contains the remaining four centre vehicles, to make the nine car set, and a few spare parts just incase you need them. Whilst this model is intended for DCC (Digital) operation, it can be used with a DC (analogue) controller of 15v or less. The model is set to DCC address 03 and has various sound options already set. 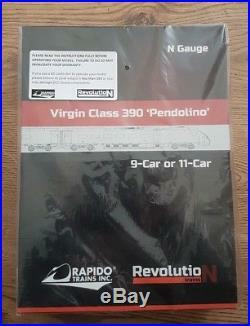 The item "Revolution Trains N Gauge 9-car Pendolino DCC Sound Fitted 390045" is in sale since Friday, May 18, 2018. This item is in the category "Collectables\Model Railways & Trains\N Gauge\Locomotives". The seller is "eatus-maximus" and is located in Oldham.